Under Building tab (Figure 4.71) you can create and modify Buildings. Additionally, you can also define different zoning rules and default Building Parameters for each Building. 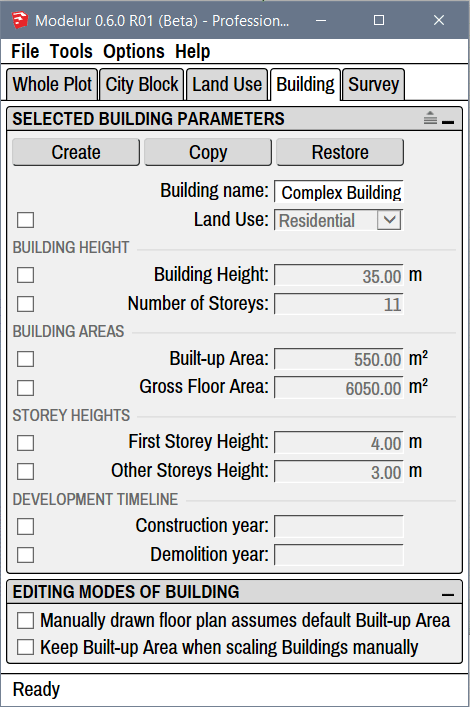 Figure 4.71 - Building tab, which shows Parameters of selected Building. Inside the Selected Building Panel you can modify the Parameters of selected Building(s). Create button is used to create simple Building, the same way as by clicking on the yellow Create Building icon in Modelur Toolbar. If no Face or Edge Loop is selected, Modelur will create a new Building based on default Building parameters. However, if Face(s) or Edge Loop(s) are selected, it will create new Building based on selected shape. This way you can create Building of arbitrary floor plan. In case when you import Buildings footprints, they might get triangulated. If this is the case, make sure you hide internal edges or use SketchUp's built-in functionality to hide Edges on coplanar Faces (Window → Default → Tray → Soften Edges → Soften Coplanar) and Modelur will clean it up automatically and create one Building from many faces. When some Buildings are selected, you can use Copy button to create their copies. Alternatively you can also use SketchUp's built-in copy methods (eg. by moving the Building around and pressing on the Ctrl key). Restore button is used to reset all Building parameters to its default values. Using Building Name parameter you can change Building's name, which is used to easily track different Buildings. Alternatively you can also rename the Building in the SketchUp's Outliner or in the Entity Info panel the same way as you would rename any other SketchUp Group when selected. Using Land Use dropdown menu you can set the Land Use selected Building(s). Land Uses are used to calculate Building's units (eg. apartments, residents, offices, etc), parking requirements, green area requirements, etc. To learn more about these settings, please visit Land Use section of this page. Building height sets how tall should the Building be in chosen units (metric or imperial). When changing Number of Storeys, First Storey Height and Other Storey Heights this parameter will adapt itself automatically. Number of storeys sets the number of Building's storeys. When you change this parameter, Building Height (described above) will be adapted automatically to reflect calculated height based on Number of Storeys and First and Other storeys Height (described below). Built-up area sets the floor area size of the Building. Please note that this value will be automatically overloaded when creating the Building (to keep drawn floor area size) unless you check the Manually drawn floor plan assumes default Built-up Area under Building tab → Editing Modes of Building. Built-up Area will automatically be adapted if you change Gross Floor Area (described below) to match the division of Gross Floor Area with Number of Storeys. Gross floor area parameter is used to define gross floor area size of the Building. If Building is created from scratch (no horizontal SketchUp Face is selected), this will be used to determine size of the Building (in combination with Number of Storeys). First storey height is used to set the height of Building's ground floor. Changing this parameter will change default Building Height, too. Other storeys height is used to set the height of all Building's storeys above ground floor. Changing this parameter will change default Building Height, too. By specifying construction year you can define when the selected Building is expected to be built. Once construction year is set, you can use Development Timeline option in Survey tab to change timeline year and see how the development will evolve in time. By specifying demolition year you can define when the selected Building is expected to be demolished. Once demolition year is set, you can use Development Timeline option in Survey tab to change timeline year and see how the development will evolve in time. When you click on one checkbox while Shift key is pressed, you will check (overload) all of the parameters of selected Building(s). In this section you can determine behavior of the Building when you create or modify it. Check this option if you want the newly created Buildings to match the size of Built-up Area when they are created. If this option is unchecked, new Buildings will have the Built-up Area overloaded so they keep drawn floor area size. By default this option is turned off. Check this option if you want to scale Buildings horizontally, but also want to make sure they do not change their Built-up Area. In other words, if you have this option checked and you scale the building in X direction, Modelur will calculate and apply the Y dimension so that the Built-up Area will not change. By default this option is turned off.